Once upon a time, people fished with a short section of fishing line tied to the end of a long cane pole or stick. Today, most sports fishermen catch fish with a high tech fishing rod and fishing reel. Four basic types of fishing reels are available: spin casting reels, spinning reels, bait casting reels, and fly-fishing reels. 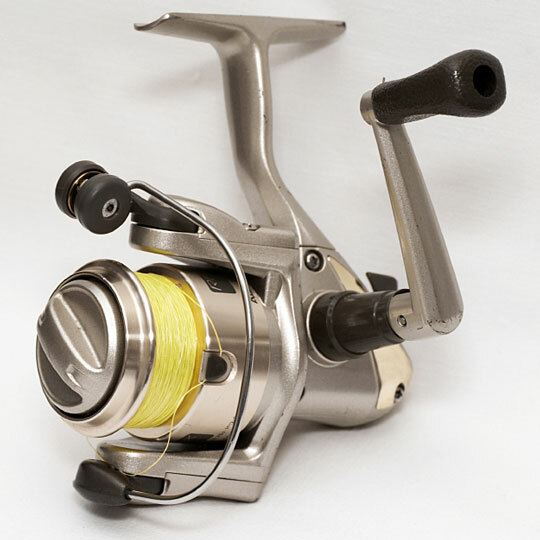 Spin casting and bait casting reels usually sit on top of the rod, while spinning reels and fly-fishing reels hang below the rod. 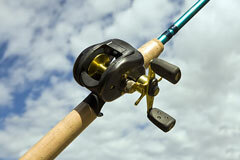 More specialized types of reels include big game reels, boat reels, and surf casting reels. Most of today's reels are labeled according to the type of fishing line they are meant to handle, while others suggest a range of length capacities for different line weights. Larger reels will generally have greater line capacities. Spin casting reels are ideal for beginner fishermen because they are inexpensive and easy to use. Spinning reels are more expensive and more versatile than spin casting reels, and they can cast lures farther as well. 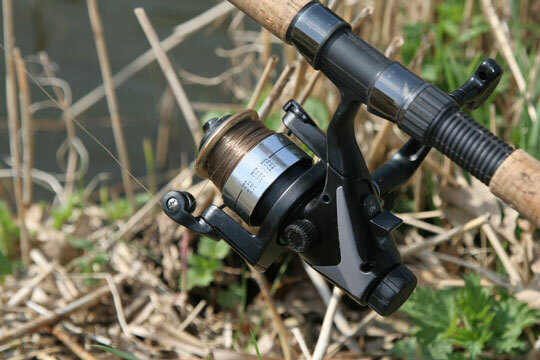 Bait casting reels, also known as casting reels, afford the fisherman more control when casting and when fighting a fish. However, they are rather difficult to use and are susceptible to backlash, a condition in which the line becomes tangled. 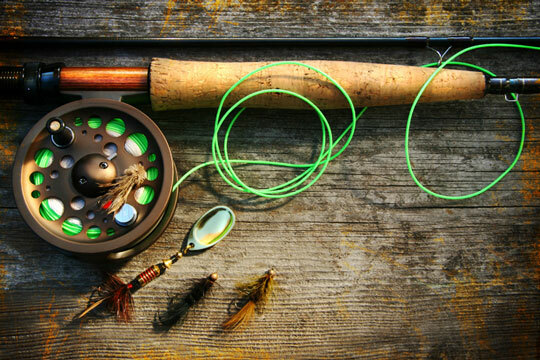 Fly-fishing reels are used by fly fishermen to hold the fly-fishing line and, in some cases, to fight strong fish with their drag systems, but they are not involved in the casting process. A spinning reel has a fixed spool that doesn't turn during the cast or retrieve. Instead, line is retrieved through a pickup mechanism called a bail, which turns around the spool as you turn the hand. Many people, especially beginner anglers, choose spinning reels because their mechanisms eliminate tangle-producing backlashes. Spinning reels come in varied sizes that depend upon the line size being used. Unlike spinning reels, bait casting reels are small revolving spool reels, many of which have level wind mechanisms. Today's bait casting reels are popular because they offer a combination of free-spool casting and adjustable drags. Other improvements include anti-backlash aids, multiple ball bearings, and variable gearing. Some bait casting reels even offer an anti-reverse, which means the handle can rotate backward similar to older types of bait casting reels. The point of this is to allow small amounts of line to be let off the fishing reel by cranking backward. There are two basic families of bait casting reels. Round reels have round end plates, and have a greater line capacity than the other family. Round reels are best used in salt water and for long-running freshwater fish. 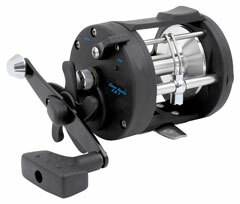 The other type of bait casting reel is smaller and lighter in weight, and has elliptical end plates. Because these reels are designed to cast farther and more efficiently, they are particularly well suited to bass anglers. Most fly reels are single action, meaning that they have no gears. Instead, the spool goes around one turn every time the crank is turned. Automatic fly reels are another type of reel, most often used for light freshwater fishing. These reels have no crank handle whatsoever. Instead, line is retrieved by winding up a spring mechanism and then pressing a trigger. The type of fly reel you use becomes a real consideration once you fish in saltwater or fish larger, longer-running freshwater fish. Reels used in fighting and bringing in fish must have a larger capacity in order to hold the fly line, as well as a quantity of backing line. If you are angling for offshore fish, the single-action reel should be passed over in favor of a more rugged machined model. If you are fishing for big game, chances are you'll need "tournament" class tackle. Some of the highest quality — not to mention the highest priced — reels fit into this category. Big game reels are generally divided into two categories. Star-drag reels are sturdy, dependable reels that feature a free spool lever and separate star-drag mechanism. Lever-drag reels, by comparison, combine the free spool and the drag-setting lever into one unit. These reels allow drag changes, which is a huge advantage over star-drag reels. Boat reels should have a free spool lever, a star-drag adjustment device, and a metal spool. Level wind reels are very popular boat reels, because they lay the line evenly on the spool so that the angler doesn't have to do this manually. When all is said and done, choosing the right boat reel depends upon the line size. As a rule of thumb, inshore fishing, including fishing done in lakes and bays, requires a reel with a minimum of 200 yards line capacity. Reels used for offshore fishing should hold 300 to 400 yards of line. While surfing reels are similar to most other saltwater reels, they are equipped with wider spools, and sometimes additional features, which make them easier to cast efficiently. Whether you are looking for freshwater or saltwater fishing reels, you are sure to find FishingReels.us a helpful resource. Our fishing tackle dealer and manufacturer listings and our angling resource links contain a wealth of information about fishing gear and recreational fishing. This outdoor outfitter features an extensive selection of rods and reels, fishing tackle and fly-fishing gear as well as trolling motors, boating accessories and fish-finders. American-made fishing reels for spinning, bait casting, fly-fishing, big game, trolling, and bottom fishing. Over 50 different reel models for freshwater, saltwater and offshore applications. This premier fishing tackle firm offers spinning reels and offshore reels. Premium quality fishing reels designed for simplicity, quality, and peace of mind. This fishing tackle manufacturer offers a broad selection of freshwater and saltwater reels. The angler's complete source for fine brand name fly-fishing gear. This South Carolina-based firm develops and manufactures quality fishing gear. Their products include rods, reels, rod & reel combos, and tackle kits as well as fishing line and accessories. Hayward, Wisconsin museum dedicated to the sport of fresh water angling. The IGFA maintains a Fishing Hall of Fame and Museum in Dania Beach, Florida.